Take advantage of what’s left of grill season and add Grilled Spicy Coconut-Lime Shrimp Skewers to your menu. The spiciness paired with the sweet coconut flavor is a perfect match. I should mention that this is a super-easy dish to make. It’s perfect anytime! For me, it’s not even close to the end of summer. My grill will be going for months here in Phoenix, and I know you’ve probably got plenty of grill time left, too. So don’t wave goodbye to the season before you make these Grilled Spicy Coconut-Lime Shrimp Skewers. I was lucky that this shrimp dish came to mind when I couldn’t think of too many other things to make for dinner. I’ve had so much chicken lately — not that there’s anything wrong with that — and I was looking for something a little different, but still easy to make. This recipe came together so quickly and took even less time to cook. Bing, bang, dinner! If you can’t get enough of grilled chicken, you should try this Jerk Chicken recipe. It’s b-i-g on flavor! Another tasty chicken option is this Grilled Chicken with Cherry-Chile Sauce recipe. I love the addition of cherries. What’s your favorite thing to grill in the summer? We probably grill four nights a week and we grill all sorts of stuff, from flatbreads to salmon to dessert. I mean, who wants a hot kitchen on a warm summer night? 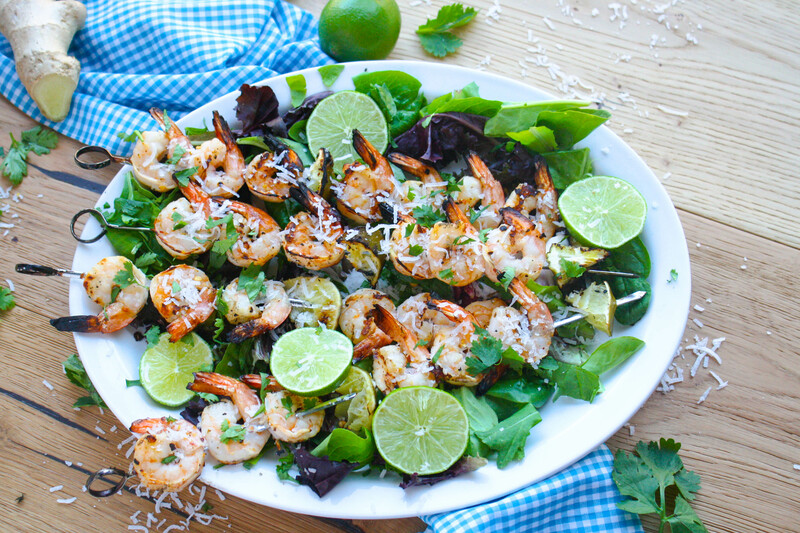 I love these Grilled Spicy Coconut-Lime Shrimp Skewers. I usually always have coconut milk in the pantry and limes and cilantro in the fridge. Oh, and chili garlic sauce —ALWAYS! If you don’t have chili garlic sauce on hand, no worries. Just use your favorite hot sauce and two cloves of minced garlic. Don’t skip out on this dish before the summer’s over! 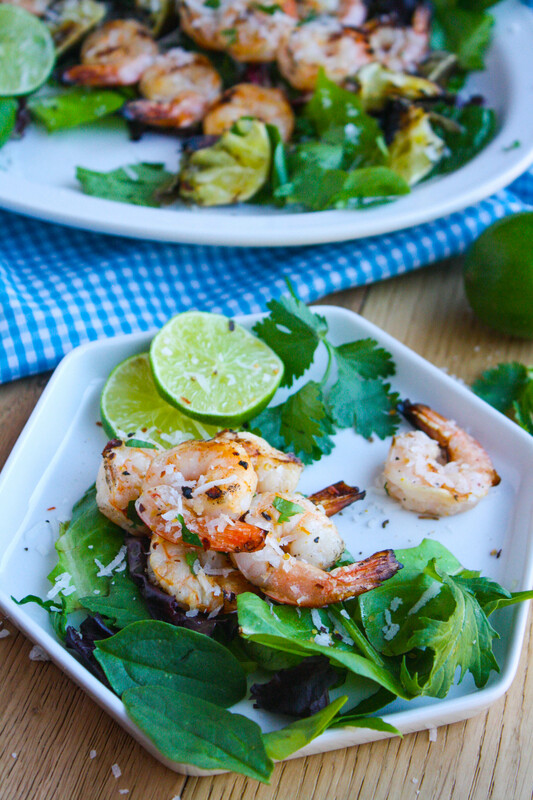 Grilled Spicy Coconut-Lime Shrimp Skewers will make dinner a welcome treat. In a medium bowl, combine the coconut milk, lime juice, chili garlic sauce, ginger, black pepper, and red pepper flakes. Whisk to combine. Add the mixture to a shallow container, or a large zippered baggie, and add the shrimp. Make sure the liquid covers all the shrimp. Refrigerate for at least 30 minutes, to an hour. Discard the liquid and thread the shrimp onto metal skewers. Grill the skewers on medium-high heat for 8-10 minutes, turning once. Add the skewers to a platter and when the shrimp is still warm, sprinkle the shredded coconut over the shrimp. Garnish with the lime and cilantro. This is the perfect recipe for summer grilling. This weekend I'm hosting a small family BBQ, and while not everyone eats red meat - everyone loves shrimp. This recipe's a keeper! Thanks so much, Denay! Hope you're able to give this a try, and enjoy! These look absolutely delicious, I'll take shrimp skewers any day! This dish looks gorgeous! Very summery. And I do love everything with coconut. And yes, let's not wave goodbye to summer just yet! We got weeks to go :) Hope you're having a wonderful one! Oh my, these shrimp skewers are mouthwatering! Thank you so much for sharing the recipe and th de beautiful pictures! Thanks so much for your kind words, Vanessa! These skewers sound so good! I think this is just a fantastic idea, and I can't wait to try it! Thanks a bunch, Leah! Hope you like it! 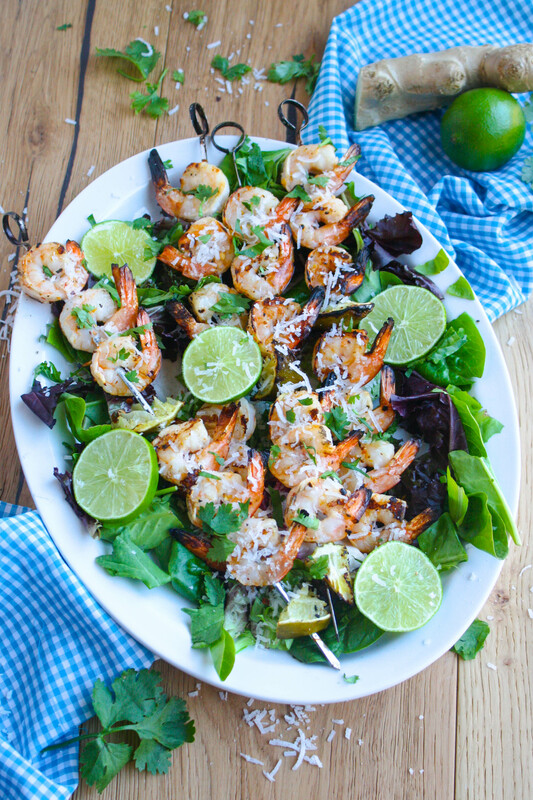 I love changing up our grill night with a shrimp dish and this one looks delicious! I love the citrus with the spice flavor combination! Thanks, Jen! I love grilling pretty much everything! I am totally craving some of this shrimp right now -- looks amazing! Yum! Yum! I would this on my dinner plate tonight. You always feature the most delicious looking meals on your site, and this one is no exception! 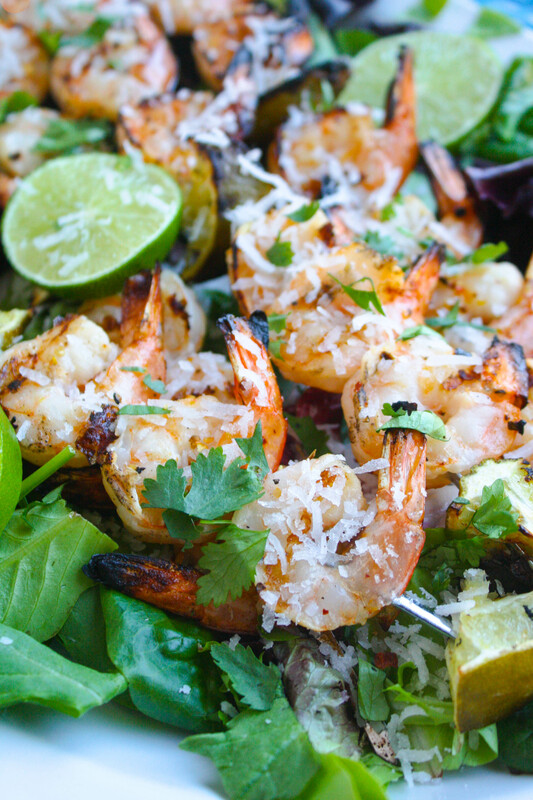 Grilled shrimp, lime, and coconut sounds like an amazing flavor combination. This is a definite must try before the end of summer. Thanks so much for your kind words, Cait! I hope you try this one -- so easy to make and so flavorful! Yummmm! 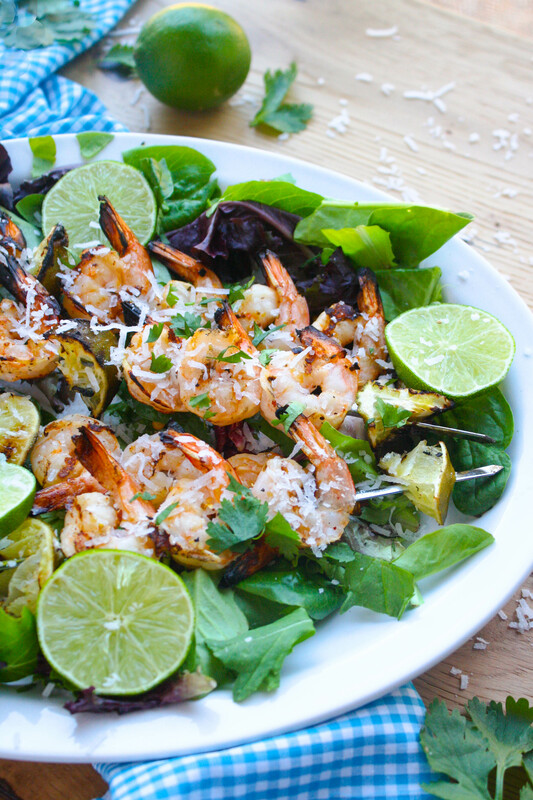 I love shrimp with lime so this looks right up my alley! Thanks, Allysin! It's so easy to put together, too! Thanks so much, Lauren! Yes, a great combo, for sure! These look so good! I need to break the grill out again tonight now! Yes! This is an easy one to make, too! Grilled and spicy go together so well in my book! These look great! Me, too! Thanks so much, Amy! Yum! These flavors sound so inviting!! This was a great dish. Grilled spicy coconut lime shirmp is my favorite dish.I loved your way of cooking.Its taste so yummy and delicious.Before this i made Punjabi Yakhni Pulao From one of the best cooking websites.Sharing a link of Punjabi Yakhni Pulaowith you: ( http://howprices.com/punjabi-yakhni-pulao-recipe/ ). Video Tutorial also available for cooking. Thanks for the kind words, and for sharing the last recipe! Cheers!